The seder need not — should not — stick to the script. Innovation is key for a memorable and fun educational experience. I don’t know what the tradition is in your family, but in ours, seder night is a dress-up affair. Suits and ties, dresses, new clothes for the kids — “Shabbes” (Shabbat) clothes we call them. Imagine our surprise when one year we arrived for seder at the door of our friends David and Shira Milgrom-Elcott in our dressy clothes, and they greeted us wearing the long, flowing robes of Bedouins! We dutifully took off our shoes and entered their home. On the right, we saw the formal dining room, the table set with fine china and crystal, seemingly ready for the seder guests. David and Shira, however, led us right past the dining room, down the hall and into their large family room. We should have known what to expect from the desert garb worn by our hosts, but we were hardly prepared for the sight of that room. Draped from the beams of the vaulted ceiling were large white bedsheets, forming a tent-like structure encompassing the center of the room. All the furniture had been taken out, except for some beanbag chairs and overstuffed pillows scattered around the floor, in the center of the “tent,” on a low coffee table, was the seder plate. Well, you can imagine what followed next! In a masterfully-led, fun-filled experience, the families in attendance enjoyed a delightful, relaxed telling of the Passover story. Once we completed the Maggid [narration] section of the Haggadah, we moved into the dining room for the seder meal. After opening the door for Elijah, we returned to the tent to complete the seder ceremony. It was a seder we’ll always remember. And that, in a word, is what the seder is designed to help us do — remember — remember the story of the Exodus and, more importantly, our place in it. After all, the most important words of the Haggadah are, “B’khol dor va-dor hayav adam lirot et atzmo k’ilu hu yatzah mi-Mitzrayim” — “All people, in every generation, should see themselves as having experienced the Exodus from Egypt.” The seder is much more than a history lesson; it is our yearly re-enactment of the liberation and continuity of the Jewish people. Thus, seder night is the family education experience par excellence. The rabbis who created its structure and content were brilliant family educators, filling the ceremony with an array of multi-sensory methods of transmitting the messages of the evening. The seder is filled with symbolic foods, elaborate rituals, words and song, and most importantly, questions designed to keep even the youngest of children interested. Although the seder is the single most observed Jewish celebration of the year in North American Jewish families, many of us base our conduct of the seder on a model we knew as children — each person takes turns reading a paragraph out of the Haggadah. In some families, that is considered a “participatory” experience. It might be, but it’s hardly engaging. When I interviewed families for The Art of Jewish Living: The Passover Seder, I learned that the search for creative ideas for seder celebration is never-ending. 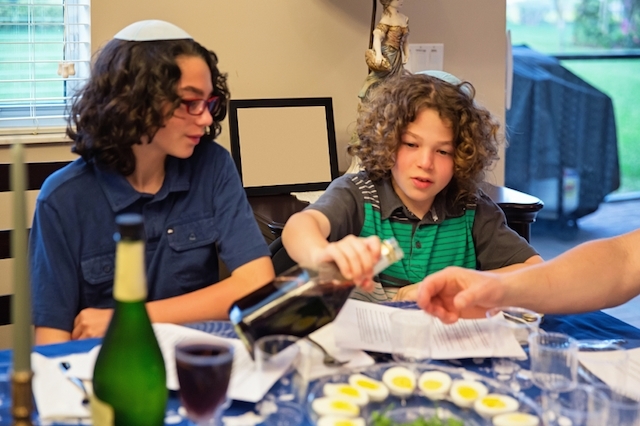 So, here are 10 tips on how you might enliven your family’s seder experience this year. When the Weber family invites the Wolfson family for seder, we are asked to prepare a presentation on some aspect of the seder ceremony. The presentation could be a d’rash–an explanation of what the Haggadah is trying to say. But, over the years, our presentations have also been given as a play, a song, and a take-off on a game show. Not everyone in your family may be able to do this, but there is no better way to encourage participation in the seder than by asking people to prepare something in advance to bring to the table. The seder ceremony of my youth never lasted more than 20 minutes. That’s how long it took to say Kiddush (the blessing over the wine), do Karpas (the spring vegetable), break the matzah, and fight over who was the youngest grandchild who could say the “Mah Nishtanah” [the Four Questions]. After a few minutes of everyone-take-turns-reading-a-paragraph, my Uncle Morton would ask the infamous “Fifth Question,” “When do we eat?” End of ceremony. One way to buy time to spend on the telling of the story is to offer your guests something to nibble on between the vegetables of Karpas and the meal. My very creative wife Susie often prepares an edible centerpiece. She and the kids slice jicama very thin and with “Jewish” cookie-cutters, stamp out jicama Stars of David, Torah scrolls, and Kiddush cups. She places the shapes on the end of bamboo “shish kabob” skewers and inserts them into a head of red cabbage placed in a wicker basket. She adds color to the display by cutting flowerettes of green and red pepper, carrots, celery, and other vegetables and placing them on skewers and into the cabbage. The result is a spectacular vegetable bouquet which we use as a centerpiece on the seder table. After Karpas, we invite our guests to “set the centerpiece” by taking the skewers out of the cabbage and dipping the vegetables into saucers of salad dressings placed around the table. Our friends Gail and Shelly Dorph buy time by using artichokes for Karpas instead of parsley. They then dip the artichoke leaves into dressings for nibbling until the meal is served. Another family we know of uses puppets and story books. The most unusual telling, however, had to be the family who presented a magical version of the 10 Plagues in costume. The father played the Pharoah who, after complaining about how thirsty he was, asked one of the kids to fetch him some cool, clear water from the Nile. The child left the dining room and returned with a pitcher of water and an empty glass. As the “Pharoah” poured the clear water into the glass, it turned red! It turns out the father was an amateur magician who incorporated a variety of magic tricks into their telling of the story. It was amazing — and unforgettable! The Haggadah invites questions. Encourage your guests to liberate themselves from the book and discuss what it is the Haggadah is trying to tell us. A favorite point to do this is after the recitation of the 10 Plagues. “What are 10 things that plague us today?” is a question anyone, no matter what their Judaic knowledge level, can answer. When the Haggadah tells us that we should feel as if we were redeemed from Egypt, what does that mean? What are we doing about Jewish continuity in our family, in our community? The discussion resulting from these questions can be the highlight of your seder. Having family fun is serious business, especially at the seder table. The seder was never meant to be dull. Quite the contrary, it is to be a relaxed, informal educational experience. Some families sing favorite songs children learn in religious school: “Go Down Moses,” “One Day When Pharaoh Awoke in His Bed,” and others. A favorite parody is “The Ballad of the Four Sons.” We read “Only Nine Chairs” by Deborah Uchill Miller (Kar-Ben Copies), a hilarious account of a family seder. Scratch the surface of most Jewish adults and you’ll find a child who was upset at not finding the afikoman. We created a way to include everyone in the afikoman search. We make a chart with the order of the seder (Kadesh, Urhatz, etc.) and select one letter from each word. We put these 14 letters on 3 x 5 cards and then hide them around the house. We tell the kids that each of them must find at least one of the cards for us to find the real afikoman. When the kids find all the cards, they bring them to the table. Then, we ask the adults to figure out a jumble-word-search two-word clue from the letters. The letters spell “at refrigerator.” Once the clue is deciphered, everyone runs to the refrigerator and finds the real afikoman! Then, of course, everyone who participated in the search gets a prize. One of the problems in keeping young children interested in the seder is that most Haggadot are not designed for them. When our kids were in nursery school, Susie created a “Pat the Bunny”-type Haggadah using the coloring sheets sent home from class. She added tactile materials to the sheets where appropriate: cotton balls on pictures of sheep, sandpaper on pictures of the bricks of the pyramids, grape scratch-and-sniff stickers on pictures of the Kiddush cups. She put these in a loose-leave notebook and made copies for the kids at the seder. They were immediately engrossed in the book, following along and participating at their own level in their own very special way. Susie also gave each child a “goodie bag” filled with Passover symbols, frog stickers, a bookmark, even moist towelettes for the inevitable spills of wine! Each year, experienced seder leaders look for new ideas to incorporate into the ceremony. Here are a few of my favorites. Instead of filling Elijah’s Cup with wine at the beginning of the seder, wait until just before opening the door and pass Elijah’s cup to each participant who pours some of her/his wine into it. This is a demonstration of the need to act to bring the Messianic era. The Sephardim [Jews of Spanish and Mediterranean descent] pick up the seder plate and place it over every person’s head during the recitation of Ha Lahma Anya, the invitation to participate in the seder. Another Sephardic custom is to beat the leader with green onions during the singing of Dayyenu as a reminder of the plagues. Save your lulav and use it instead of a feather to collect the last vestiges of hametz during the annual Bedikat Hametz search on the night before the seder. Ask a set of modern “Four Questions” to discuss at the ceremony. Challenge your guests to sing all the verses to “Had Gadya” [the song “One Kid”] in one breath. Sing Had Gadya with sound effects: choose a person to create the sound of a goat, a cat, a dog, a stick, fire, etc., which they make after the words are sung. (The most interesting sounds will be for the “Angel of Death” and “Ha-Kadosh Barukh Hu”)! 9) Choose a good Haggadah. There are 3,000 editions of the Haggadah catalogued in the great library of the Jewish Theological Seminary, and every year more versions appear. Jews have always felt comfortable in putting together Haggadot that reflect their particular slant on experience of the seder. So, we have “The Haggadah for the Liberated Lamb” (a vegetarian Haggadah) and “The San Diego Women’s Haggadah” (a feminist Haggadah). We have traditional unedited texts and greatly abbreviated liberal texts. We have new “family” Haggadot and that old standby, the Maxwell House Haggadah. In the Conservative Movement, we have the excellent Rabbinical Assembly Haggadah, The Feast of Freedom. Choose a Haggadah that fits your family’s needs. Since the cost of multiple copies is often quite substantial, pick one that will last a number of years in style, substance, and construction. Remember, the book itself should stand up to extensive use. Of course, the ultimate Haggadah may be one you yourself put together. With inexpensive printing widely available, it is not difficult to edit your own Haggadah text. You can easily combine traditional texts with modern interpretations and readings, songs, and information. By studying the Haggadah text with the help of guidebooks like The Art of Jewish Living: The Passover Seder, you can develop a text that reflects your understanding of the seder story and that fits the needs of your family. This will take some time, but the reward will be a seder experience that is meaningful and memorable. Reprinted with permission from The United Synagogue Review. Pronounced: LOO-lahv (oo as in boo), Origin: Hebrew, a bundle of branches representing three species — willow, myrtle and palm — which are shaken together with the etrog on Sukkot. What you need to know about the festival of freedom. Delicious dishes for you and your family for the seder and beyond. Key words and phrases for Passover.